On Friday, June 24, three artists are hitting the stage for a performance you don’t want to miss. 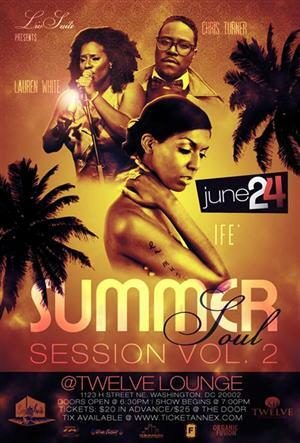 LivSuite Presents Summer Soul Session Vol. 2, featuring Lauren White, Chris Turner, and Ife’. These artists are an eclectic mix of R&B, Neo-Soul, Jazz, and Funk. “Love Child” Chris Turner decided at the tender age of 4 he wanted to be a singer, just like his father. This Oakland, CA native has been performing most of his life. Past affiliations include the SF Jazz High School All-Stars and GRAMMY High School Jazz Ensemble. Chris has been on tour with Gwen Stefani, Chris Brown, Kelly Clarkson, and Bilal Oliver. Currently working on his first full album “LOVEchild”, Chris was selected in February of this year by BET Music Matters as an “Artist to Watch”. As you can see, this show on the 24th is going to be filled with wonderful talent, and if you’re in the DMV, you definitely don’t want to miss it. The venue for Summer Soul Session Vol. 2 is XII Restaurant and Lounge, located at 1123 H Street NE, Washington, DC. Advanced tickets can be purchased now for $20; they will be $25 at the door. Bring your man, bring your girl, or just come by yourself. Until next time, I’m just a Southern girl…in the city!